Known as one of the premier destinations in the United States for mountain vacations at any time of year, Lake Tahoe is home to a number of wonderful attractions, activities, and places to stay. From tranquil lakes and imposing mountains to serene forests and balmy beaches, Lake Tahoe has it all. And with the help of Tahoe Signature Properties, you can stay close to all of the action, within glimpsing distance of the best sights in Lake Tahoe! 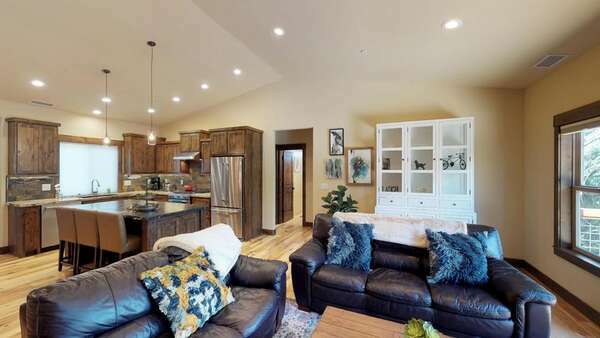 Continue reading on down below to find out more about our high-quality forest view vacation rentals in Lake Tahoe and how they can add a touch of something special to your trip! When you want nothing less than the best for your vacation needs, Tahoe Signature Properties has the houses for rent in Lake Tahoe that you’re looking for. In particular, our forest-view vacation properties immerse you in the peaceful environ of Lake Tahoe’s forests, without leaving you exposed to the elements like you would be if you were camping in the middle of it. Imagine waking up each morning during your stay in one of our vacation rentals in Lake Tahoe to the gorgeous splendor of the forest. If you visit during the warmer months, you can enjoy the quiet shade of vast swathes of trees, lush and green, stretching out across the horizon. Sunlight diffuses through the branches, creating a dappled pattern on the forest floor. Wildflowers inject vibrant colors into the scenery and draw in wildlife like butterflies and hummingbirds. In the fall, fiery hues of red, orange, and yellow dominate the forest, setting the forest alight with colors you could only dream of seeing if you live on the West Coast. And, should you choose to come during the winter, you can bask in the peaceful, silent solitude of snow-covered trees—perfect for cross-country skiing or snowshoeing in the middle of nature, in a picturesque backdrop fit for a card or a painting. No matter what time of year you decide to visit, our airy forest view Tahoe rentals with full-sized kitchens, top-tier appliances, spacious rooms, plush furnishings, and cozy fireplaces serve as your home away from home in Lake Tahoe. With Tahoe rentals already taken care of, it’s time to venture out and see what Lake Tahoe has in store for you. And there’s a lot you can enjoy here. If you’re a history buff, then the North Lake Tahoe Historical Society is right up your alley. For one thing, it includes a few museums that deal with different aspects of Lake Tahoe. The Marion Steinbach Indian Basket Museum displays more than 250 baskets from Western North America. The Gatekeepers Museum is built in the location of the cabin that was the home of the Watermaster, whose job it was to control the water out of Lake Tahoe. Watson Cabin was built in 1909 as a honeymoon cottage for his son, Bob, and his bride. William B. Layton Park is a 3-acre park next to Truckee River and has two hiking trails, Back Bear Forest and Cottonwood Natural, that attract hikers from all over. Before you set out on your planned adventure, you need to make sure you’re suitably equipped. Outdoor adventures are not safe without the proper gear. Many shops in the area sell or rent such equipment. Ski Butlers provides all your skiing gear and even delivers it to our vacation rentals in Lake Tahoe for convenience. Alpenglow Sports in Tahoe City offers all your cross-country skiing and backcountry skiing gear needs as well as hiking, backpacking, and rock-climbing equipment. Northstar California Skiing & Snowboarding is the nation’s top manufacturer of snowmaking systems and intermediate cruisers. You’ll find just about everything you need for your skiing adventure under one roof. Just because you’re on vacation doesn’t mean you can’t go to the movies. Actually, being on vacation should be the main reason you go watch a movie. And North Lake Tahoe has got a bunch of movie theaters that offer a whole different theater experience. It’s a place for the whole family to enjoy an evening out being entertained by the latest box office hits and first-run features. The Tahoe Art Haus & Cinema is both a theater and a bar. And if you still have something for drive-in theaters, Homewood Mountain Resort has you covered. Free movies are on offer Tuesday evenings at West Shore Cafe & Inn. The movies are free to attend and feature family-friendly movies such as X Men, Shrek, Big, and many others. West Shore offers their free movies during the summer months. Contact our reservations team to learn further information about our awesome Tahoe rentals with spectacular views of the forest when you book your trip accommodations through Tahoe Signature Properties today!